I used this sleeping bag on two separate and wildly disparate winter backpacking trips. The first was a pretty standard California Bay Area winter weather affair, with temps in the low 40s at night. The second was a slightly unexpected desert freezefest in Joshua Tree, complete with morning tent icicles and snow. I probably put this poor bag through more than could possibly be expected from it. 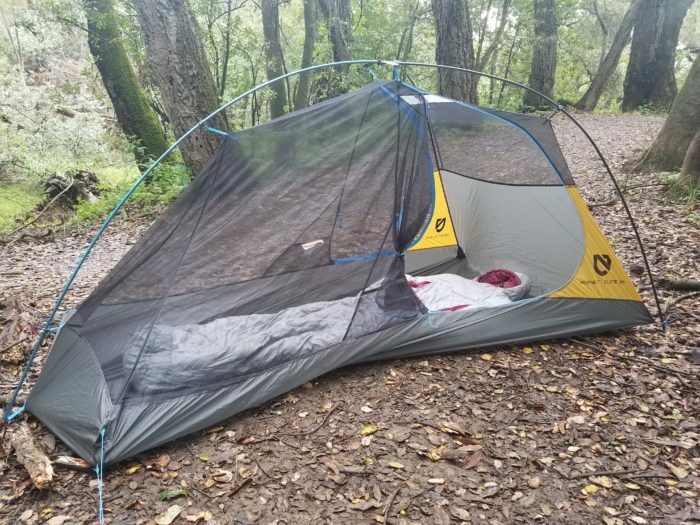 My first backpacking trip was about the coldest I thought I would find in my neck of the woods, where there’s the occasional but not common drop to the 30s at night. It’s actually been an unseasonably cold winter and even some Bay Area peaks have gotten a snow dusting or two, but you’d still be hard pressed to spend a night anywhere near the 25-degree lower limit of this bag. I spent my first trip snug as a bug in a rug. The only thing I had to worry about is the heavy condensation that can accumulate while camping in a coastal redwood forest, and the bag performed well in damp conditions. The forecast did call for mid 30s and rain before our trip to Joshua Tree, so I decided to bring a sleeping bag liner for some extra warmth and insurance since I knew I would be dabbling in the bag’s limits. At 4,000 feet, it ended up not being colder than the bag’s 25-degree lower limit, but it was definitely somewhere in the 25- to 35-degree range. With the liner, my feet were cold but I would describe the rest of me as very, very not warm. Obviously, the bag doesn’t promise to keep you warm under 35 degrees, so I took tepid with cold feet to be a fairly good sign overall. Down: The Aya is filled with Premium 800 FP down. Thermo gills: It also has vents that can be unzipped in the midsection to allow a little airflow when it’s warmer, which is pretty nifty. 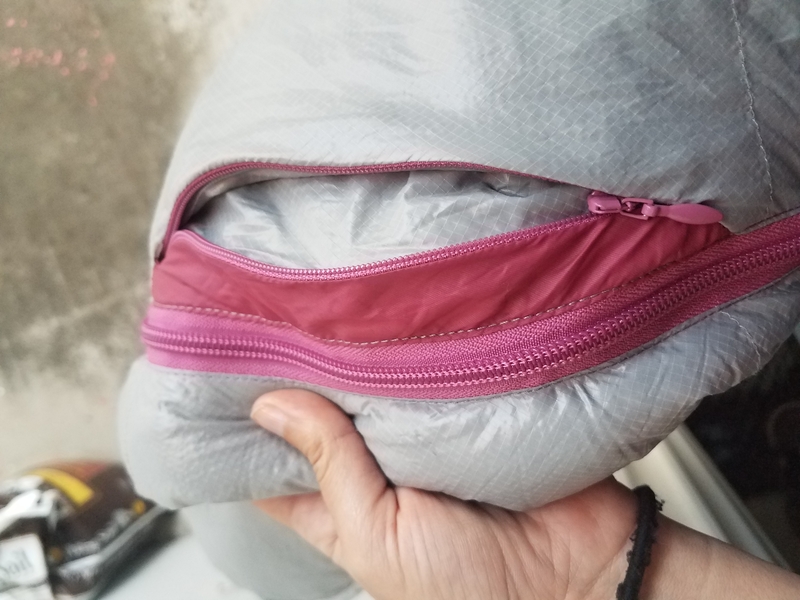 I did unintentionally leave them unzipped during my first trip, but I think because I have a tendency to sleep with my bag upside down—I’m a stomach sleeper and I don’t like my face mashed into the hood—they weren’t properly utilized and temperatures didn’t really call for their use anyway. They will be a nice feature for those inevitable nights when it’s too warm to be really burrowed in but to cold to fully unzip the bag. Waterproof hood and footbox: This bag continues Nemo’s trend of waterproofing their footboxes and the hood is waterproof as well, so you can thrash and kick against wet tent walls to your hearts content. The material is still breathable, so you won’t wake up with sweaty feet. Shoulder pocket: The bag has a small, zippered pocket in the right shoulder. My first instinct was to store freezables in there, i.e., water filter, contacts in solution, electronics. It’s not big enough to hold a bottle, but if temps are cold enough to freeze a bottle solid and undrinkable, you probably shouldn’t be using this bag. It is a nice feature that removes the need to toss everything into the depths of your sleeping bag. You won’t roll onto your phone in the night, or have to spend five minutes fishing everything out the next morning. In terms of its overall size, its body-tapered core and tailored patterning make for a very snug fit; you best not be a one-knee-bent sleeper. I couldn’t bring my arms in the bag and hold my Kindle far enough away from my face to not fog up the screen with my breath. I had to hold my Kindle outside the bag to read. Cold arms! The horror! It fits up to 5’6″ (the long version is an extra ounce and fits up to 6′), which is something to be aware of. At 5’3″ I noticed my toes touching the bottom, but still had enough vertical space. Taller women may have some issues. It’s also less poofy—for lack of a better word—than other bags I’ve used. 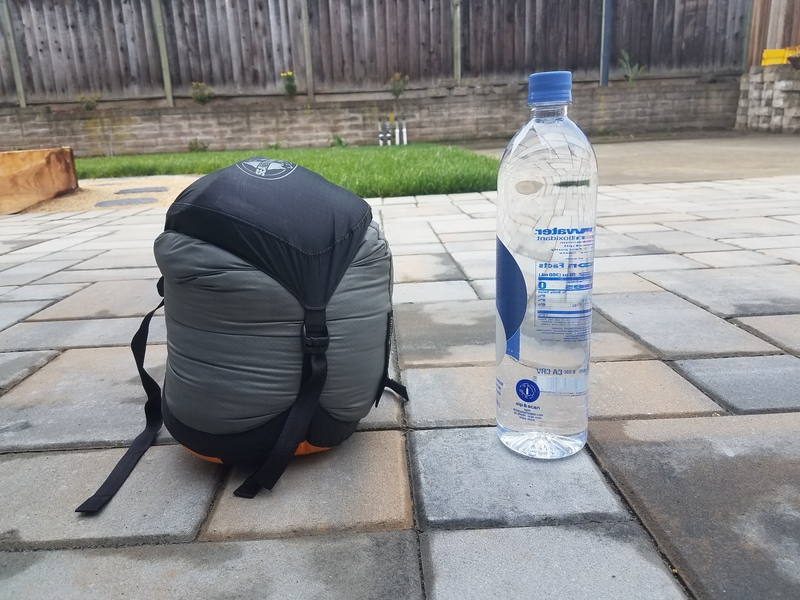 All those things add up to a bag that packs down pretty small; its 3.4 compressed volume ties for the smallest of comparable bags at REI.com, and in my Sea to Summit Ultra-Sil eVent compression sack it squishes down to roughly the size of a fat Nalgene. At 1 pound 12 ounces (2 pounds, 1 ounce for the 15 degree option), it is lighter than most comparable bags on REI.com. However, there is one a couple of ounces lighter at a similar price point and one just a couple ounces heavier that is significantly cheaper. Both of those bags are as stripped down as a sleeping bag can be without being a quilt (always your lightest option), meaning the cost/weight difference is likely due to the extra features offered by the Aya. The bag is one of the most expensive of comparable options on both REI.com and backcountry.com, meaning those willing to sacrifice some pros to cut costs should look elsewhere. Since it packs down small, it’s a good bag for people that struggle with pack space or just like it when their pack looks svelte. With the addition of the Thermo Gills™ for some extra temperature flexibility, the Aya works well as a summer bag that can still get use in the spring or fall. It’s valuable to have some versatility in gear you’re going to shell out several hundred dollars for regardless, sometimes more so than a less expensive option that can get less use. 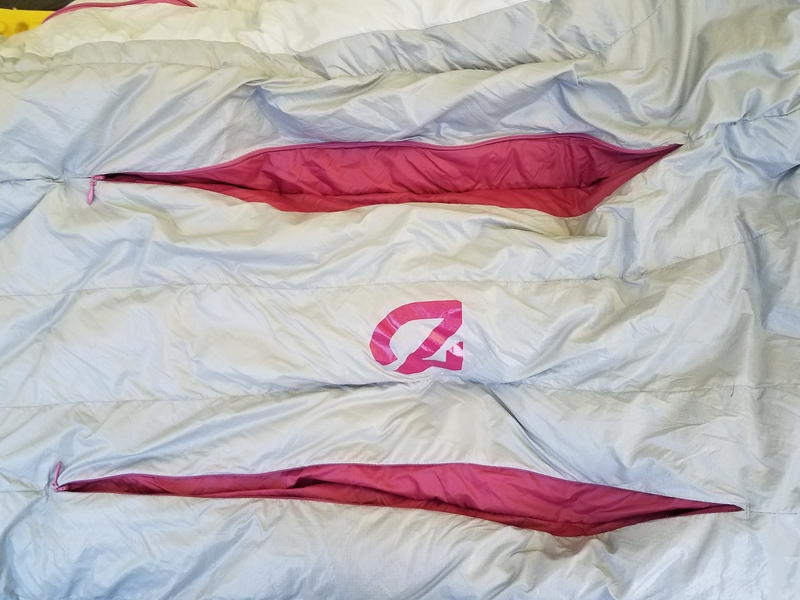 It’s got a lot of features that improve upon a basic sleeping bag design that range from nifty to really, really convenient. It’s on the snug side, even for those used to mummy bags. It’s price point won’t be worth it to all, especially for those looking to buy lots of gear all at once on a budget, as one often needs to before a thru-hike. While it’s light, it’s not the lightest option out there. Those that prefer the absolute bare bones approach to ultralight gear will want to look elsewhere. As with all things, no one piece of backpacking gear can have everything and the buyer has to figure out what’s important to them. You can get a lighter bag if you’re willing to give up some features and you can get a cheaper bag if you’re willing to give up some features (and add some ounces) and you could get a much lighter quilt if you’re will to give up ALL features. But sometimes it’s nice to have something a little souped up. Sometimes it’s nice to get to say, “Ah yes, those are the Thermo Gills” when people ask and to smile smugly into your instant coffee when someone is showing the Sawyer Squeeze shaped indent on their thigh in the morning. I would say this bag is for the people that are fairly weight conscious but still like the souped-up backpacking gear of the world. This item was provided for purposes of review. Hi, I'm Becky. I thru-hiked the Appalachian Trail in 2017. These days I work with children who are completely unimpressed by my past exploits. I offer a lot of advice about thru-hiking you can probably ignore.